FOLLOWING a successful career in the City, the daughter of a compulsive hoarder has penned a novel reliving the effects of growing up with her mother’s illness. Concealment tells the story of high flying Amy, a partner in a top global accountancy firm. Outwardly, Amy projects herself as a confident professional, but she is haunted by the legacy of her traumatic childhood. She manages to hold herself together until a new bully-boy boss shows up and a young colleague is murdered – at which point her fragile equilibrium is shattered. Caught in a tangle of business and personal connections, Amy’s past starts to catch up with her as she struggles to expose the truth. Rose is only too happy to reveal the true inspiration behind the book is her childhood and adolescent years coping with a dysfunctional and chaotic home environment which arose as a result of her mother’s hoarding. Rose and her sister grew up in a middle class household with an academic father and a teacher as a mother, who, curiously, was always immaculate in her appearance at work. She emphasises it is not just a trailer park issue, which is mostly what is conveyed in television shows. It was when her father died suddenly when Rose was just 10 that her mother’s problems really started. Rose went on: “People may have seen the TV shows or read various magazine articles, but that doesn’t mean they understand the full effects of the disorder on children forced to live with a hoarding parent. 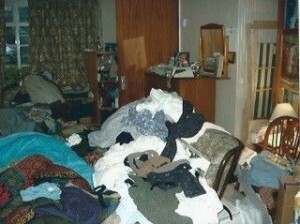 “It’s not just a matter of having a messy house. I was a twelve year old child carrying pans of boiling water upstairs to the bathroom because when the plumbing failed my mother refused to let anyone in to fix the problem. “The fridge was filled with rotting food covered in fruit flies and we had to walk through so-called ‘goat trails’ between piles of years-old newspapers. Even now, there is little awareness of the damage that hoarders do to their children, but at the time Rose was growing up there was no knowledge of the disorder itself. She said: “As far as I can ascertain, the first major research paper on compulsive hoarding was published in 1987 and it was not until 1996 that the term was fully defined. “As a child of the 1970s, this work lay in the distant future. All I knew was that after my father’s sudden death, our home descended into squalor and filth. “And not only were there no words, there was no internet or support groups – only secrecy and shame. I thought we were the only family in the world to live this way and felt sure the mess was my fault – that was what my mother told me after all. It seemed like my whole teenage years were spent making excuses why friends couldn’t come over, and hiding the ‘Big Secret’ from the rest of the world. In 2007 Rose decided to jump off the corporate hamster wheel and began to write thrillers set in the business world. After her first book, Never Say Sorry, was published in 2012, she found the courage to speak out via Concealment about the mental illness which is compulsive hoarding. Rose’s mother is now in a care home where, (in final irony), the newspaper is thrown away daily. Rose is now trying to raise awareness of the problems children of hoarders face and have to deal with and is a moderator in the Yahoo group ‘Children of Hoarders’. Half of the profits raised by book sales will go directly to Children of Hoarders Inc, a US-based not for profit organisation. In 2007, after more than 20 years in business, Rose jumped off the high-flying corporate hamster wheel and now writes financial thrillers with a strong ethical theme. Her writing draws heavily on her considerable insight into the business world and in particular the uncomfortable conflict between individual and corporate objectives. Concealment is Rose’s second novel. Her debut thriller, Never Say Sorry, about a big pharma cancer cure conspiracy, was published in 2012. This entry was posted in rose edmunds. Bookmark the permalink.